Cooper and Kleinberg: Relationship of Temporomandibular Disorders to Muscle Tension-Type Headaches and a Neuromuscular Orthosis Approach to Treatment. J. Cranio. Practice, April 2009, Vol. 27, No.2, pp. 101-108. A prominent etiological theory proposed for TMD related headache is that it results from a dysfunctional masticatory muscle system, wherein muscle hypertonicity is frequently caused by dental temporomandibular disharmony. The central goal of this article was to determine from a literature review of the subject whether there is a significant evidence to support a relationship between headaches and TMD prevalence. A second purpose was to determine from such a r eview whether any relationship was one of cause and effect and whether treatment of the TMD condition can result in meaningful reduction or resolution of headaches In the literature, there was a substantial amount of evidence for a positive relationship between TMD and the prevalence of headaches, and most importantly, that these were the muscle tension-type. Evidence for a cause and effect relationship was strong. It generally showed in numerous patients that TMD treatment of a large number of patients resulted in significant improvement in the physiological state of the masticatory system (muscles, joints and dental occlusion). Reduction or resolution of muscle tension-type headaches that were present was clinically significant. 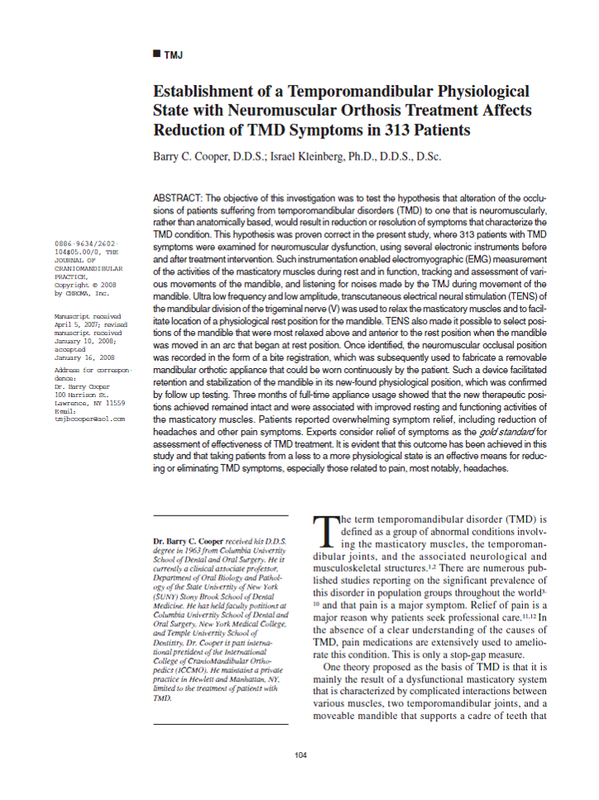 The authors concluded that TMD should be considered and explored as a possible causitive factor when attempts are made to determine and resolve the cause of headaches in patient with this affliction. A benefit of resolving headaches at an early stage in their development is that it might result in the reduction of its potential for progression to a chronic and possibly migraine headache condition. There are numerous published studies reporting on the significant prevalence of this disorder in population groups throughout this world and that pain is a major symptoms. Relief of Pain is a major reason why patients seek professional care. In the absence of a clear understanding of the causes of TMD, pain medications are extensively used to ameliorate this condition. This is only a stop-gap measure. TMD: a result of dysfunction complicated with muscles, TM joints and the moveable mandible that supports the teeth. PHYSIOLOGY: Muscles function under less than ideal conditions result in compensating muscle activity which needs correcting. RESULTS: Deterioration of muscle function progresses into self perpetuating chronic pain of increasing dysfunction and pain. Cooper and Kleinberg: Establishment of a Temporomandibular Physiological State with Neuromuscular Orthosis Treatment Affects Reduction of TMD Symptoms in 313 Patients. J. Cranio. Practice, April 2008, Vol. 26, No.2, pp. 104-117. 1) Test patients who presented with chronic symptoms of TMD could be objectively brought from a state of neuromuscular dysfunction to a state of function using instrumentation. 2) Whether orthosis treatment can facilitate changing a non physiologic situation to one that is physiological. 3) Most importantly, whether such alterations result in relief and/or reduction in TMD symptoms, especially one as discomforting as pain. 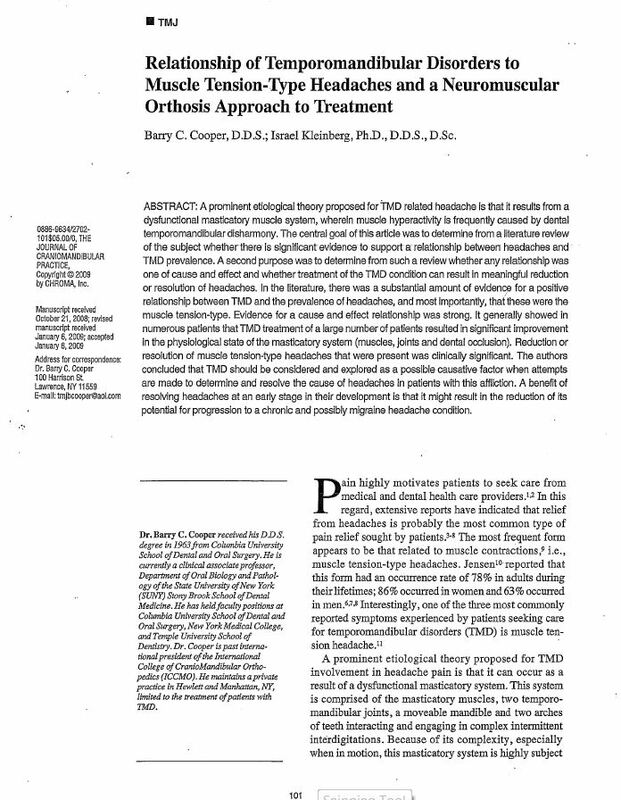 Findings: Study clearly demonstrates that there is a physical dysfunctional basis for TMD, which can be corrected by establishing a neuromuscular occlusion and the use of an oral orthosis that provides this corrected occlusion. Drastic reduction in TMD symptoms were observed. Study clearly shows that using EMG and mandibular tracking of a TMD patient’s neuromuscular occlusion, and correcting such by using orthotic devices, can result in disappearance and or substantial reduction in the number and magnitude of many of a TMD’s patient’s symptoms. This includes headaches, which in this study resulted in a 91.7% reduction in their prevalence at three months. These results support the view that most patients seeking relief from headaches and other painful symptoms are not doing so for psychological, but for physiological reasons. This approach demonstrates that drastic reduction in the magnitude of TMD symptoms can be achieved in a relatively short period of time. This is consistent with the ultimate goal of therapeutic intervention, to bring patients from a less healthy to a more physiologic healthy state. Reduces in the need for medications to control pain which at best can only be temporary and incomplete solution. This study of 313 patients: Reported 15.9% of the test population had occlusions (natural dentitions) that were coincident with the TENS neuromuscular trajectory. [That means that the remaining 84.1% were not coincident with the neuromuscular trajectory]. This study clearly is proof that “physiologic bites” can be coincident with natural dentition (not always down and forward as some wrongly advocate). In order to know that, one has to measure objectively and not assume. Cooper, B: The Role of Bioelectronic Instrumentation in the Documentation and Management of Temporomandibular Disorders. Oral Surgery Oral Medicine Oral Pathology, January 1997, Vol. 3, Number 1, pp. 91-101. Temporomandibular disorders (TMDs) can affect the form and function of the temporomandibular joint, masticatory muscles, and dental apparatus. Electronic measurement of mandibular movement and masticatory muscle functi on provides objective data that are defined by commonly accepted parameters in patients with TMDs; these data can then be used to design and monitor therapy and enhance treatment therapy. I this study, data on 3681 patients with TMD are presented, including electronic test data and 1182 treated patients with TMDs. Electronic jaw tracking was used to record mandibular movement and to compare the presenting and therapeutic dental occlusal positions. Electromyography was used to analyze the resting status of masticatory muscles and aided in the termination of a therapeutic occlusal position. The data show a positive correlation between the clinical symptoms of TMD and the presenting occlusion, accompanied by muscle activity A strong positive correlation also appears to exist between a therapeutic change in dental occlusion to a neuromuscular healthy position with use of a precision orthotic appliance and the significant relief of symptoms within 1 month and a 3 months. (Oral Surg Oral Med Oral Pathol Oral RAdiol Endod 1997; 83:91-100). ZHANG Fei-yu, et.al.,: Effect of Occlusal Splints for the Management of Patients with Myofacial Pain: A Randomized, Controlled, Double Blind Study. Chin Med J 2013;126 (12). patients by clinical assessments and surface electromyography (sEMG) measurements of masseter muscles (MM). frequency (MF) as linear indices of sEMG data were used to demonstrate muscle activity and muscle fatigue. Data were analyzed by ANOVA and post hoc SNK test. The differences were considered significant at P <0.05. Results: It was found that 89% of group A either completely recovered (39%) or clinically improved (50%), while only 22% of group B had a spontaneous improvement. sEMG analysis showed that at MPP, the mean of RMS value of MM in group A was lower than that of group B, which shows statistical differences (P <0.01). At ICP, the RMS value of MM in group A was higher than that of group B, which shows statistical differences (P <0.01). At MPP, MF value of MM in group A was higher than that of group B (P <0.05). At ICP, MF value of MM was lower than that of group B (P <0.01). Occlusal splint could eliminate or improve the signs and symptoms of TMD patients with myofascial pain. sEMG analysis indicates that the wearing of occlusal splints may reduce the degree of fatigue of the masticatory muscles. The splint therapy outcome has a correlation with the electromyographic changes in the masticatory muscles. Conclusions: Occlusal splint could eliminate or improve the signs and symptoms of TMD patients with myofascial pain. sEMG analysis indicates that the wearing of occlusal splints may reduce the degree of fatigue of the masticatory muscles. The splint therapy outcome has a correlation with the electromyographic changes in the masticatory muscles.